Happy Birthday America! We’re talking about how to get your non gaming friends into the hobby, maybe a day too late. Oh well! 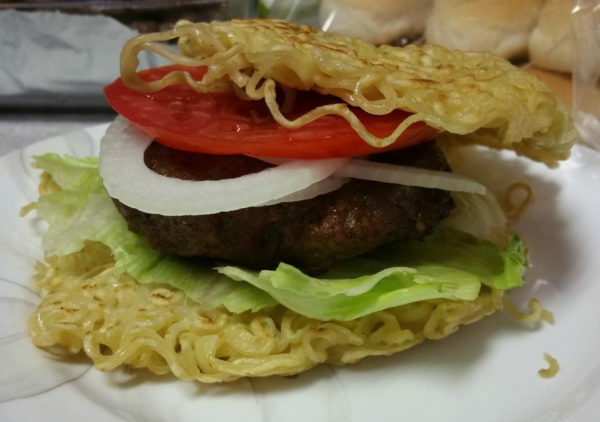 We also featured a special burger recipe from one of our Twitter followers! Beat 2 eggs in a bowl; season with salt and pepper. Stir noodles into eggs until evenly coated. Divide noodles into 6 burger-size ramekins or bowls. Place a sheet of plastic wrap directly over noodles and stack another bowl on top to flatten noodles. Refrigerate until firm, about 20 minutes. Mix beef, soy sauce, and sesame oil in a bowl. Divide beef mixture into three equal portions and shape into patties. Pan fry or grill the hamburger patties to your preference and dress each burger with lettuce, tomato and onion (and any other condiments as desired).